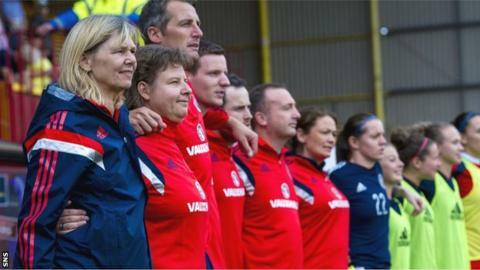 Anna Signeul says her Scotland players can "relax" when they play Sweden in their final 2015 World Cup qualifier. The Scots head to Gothenburg on Wednesday after sweeping aside Faroe Islands 9-0 to secure at least a play-off spot for the finals in Canada. They will qualify automatically if they better the 3-1 result in June. "We can go there and relax because we don't need to do anything; we can just try to beat them," said the coach. Sweden have maximum points from their nine matches so far and the only points Scotland have dropped are those against the table toppers. The 9-0 win over the Faroes at Fir Park was Scotland Women's biggest victory of the Group 4 matches so far. "I'm delighted. I'm so proud of them," Signeul told BBC Scotland. "They did fantastically well. It wasn't an easy game because it's difficult to score goals against teams like this, teams that sit so deep, but I think in the first 25 minutes we were brilliant, and the second half was also very good. "The whole team is doing so well at the moment. From Gemma [Fay] - it is never easy being a goalkeeper, especially in games where you have nothing to do and need to remain focused - who is a great captain, too, to Jennifer [Beattie], who has really grown in her role. "Rachel Corsie is doing great, as is Frankie [Fantom-Brown]. Every player is showing strength performance after performance and in every position we're good." Signeul was particularly pleased about the depth of her squad, despite being without injured key players Leanne Ross and Lisa Evans for the double-header. She said: "I thought we would feel the loss of Lisa a bit more than we did, maybe, because she is such a great striker for us. "But it just shows the depth that we have. I think that's the big difference now, and we scored, again, from so many places on the park, so it's fantastic." Her views were echoed by Hayley Lauder, who was one of the stand-out performers in the match, putting Jon Pauli Olsen's team to the sword at every available opportunity. "I'm very pleased. That's what we set out to do; to get in to the play-offs first of all, and now we can go to Sweden and challenge them for automatic qualification," she said. "It's been a good campaign. It's the the first time I've played left-back throughout and have managed some good performances but most importantly of all we've put ourselves in a great position and it's still all to play for. "We have to go to win on Wednesday - we've got nothing to lose and I'm sure we'll show that."